ICYMI [for those who don’t speak text, this means in case you missed it], white is sort of hot. Yes, we are being a bit cheeky, but white is perhaps the most winningest color of all for kitchen cabinets – whether used in a classic theme, or a hip, modern theme. 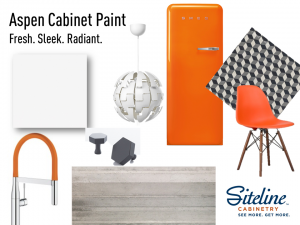 At Siteline Cabinetry, we recognize that white is the go-to color for the kitchen, and have responded with two new white cabinet paint colors: Iceberg and Aspen. Iceberg evokes a startling bright white – as if the sun is glinting off an iceberg. As a base color for one of the surfaces that carries the most visual weight in the kitchen [cabinets, of course], Iceberg creates a crisp, clean and classic foundation. Sources (left to right): Siteline Cabinetry Iceberg White Paint sample; lettuce image courtesy of foleysproduce.com; RH RUIVAST Edison Industrial Ceiling Hanging Light, Antique Black Metal found at lightingshop.org; Merola, TileBraga Classic 7-3/4 in. x 7-3/4 in. ceramic floor and wall tile found at homedepot.com; acrylic bar stool found at thisnext.us; GE Café Series, Black Slate appliances found at geappliances.com. 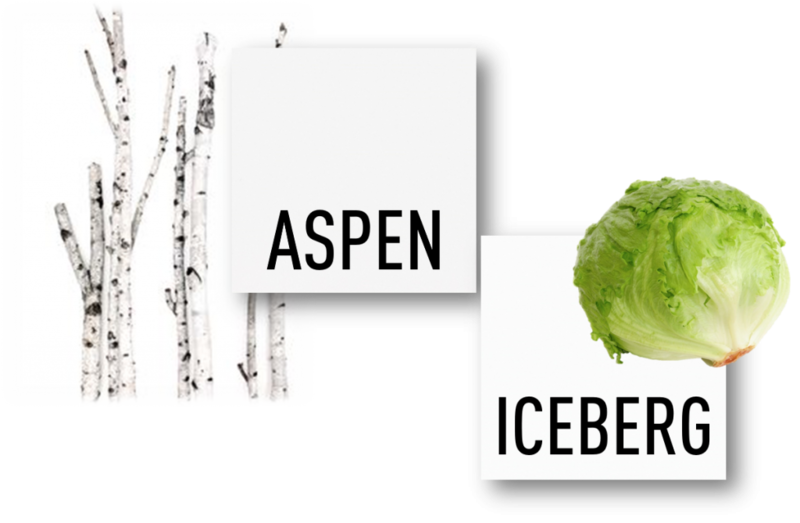 Aspen evokes an ever so graciously grey-tinged white – as if you’re looking at an amazing Ansel Adams photo of white-barked Aspen trees. 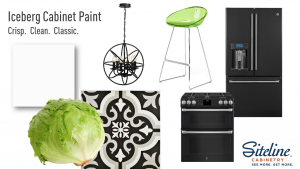 Aspen too provides an excellent base color for today’s fresh, sleek and radiant kitchen themes. Adding a pop of color in contrast to Aspen provides extreme personalization — not to mention fun. Sources (left to right): Siteline Cabinetry Fulton Door Style, Maple/MDF material, Aspen Paint, Satin Sheen; Grohe® Essence, GROHFlexx kitchen hose spot in orange; Ikea® PS 2014 Pendant Lamp, White; Schoolhouse Electric & Supply Co. Hex Knob – True Black; Smeg® 50’s Style Refrigerator, Orange; Tilebar Florina Genova Cenere 12×48 Porcelain Tile Backsplash; Cement Tile Shop Harlequin Hex; Houzz® Poly and Bark Vortex Side Chair Walnut Legs, Orange. Like what you see here? Want to learn more? Click here for a Siteline dealer near you!